You either love sushi or you hate it. Some people can’t handle raw fish. Some can’t take the helping of rice, veggies, and fish all at one. Well, these are cooked, light and palatable so that even the pickiest of eaters will be lunging for the chop sticks. 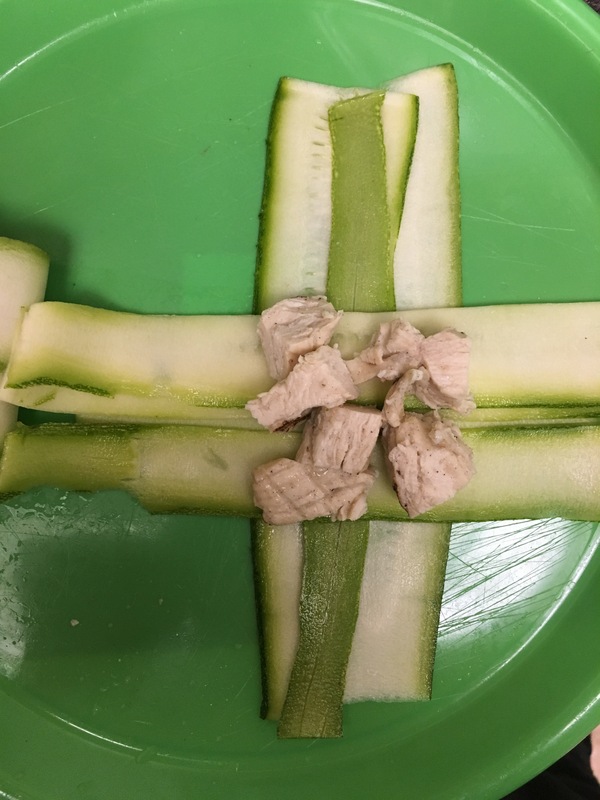 Rolls: Cut edges off cucumber. 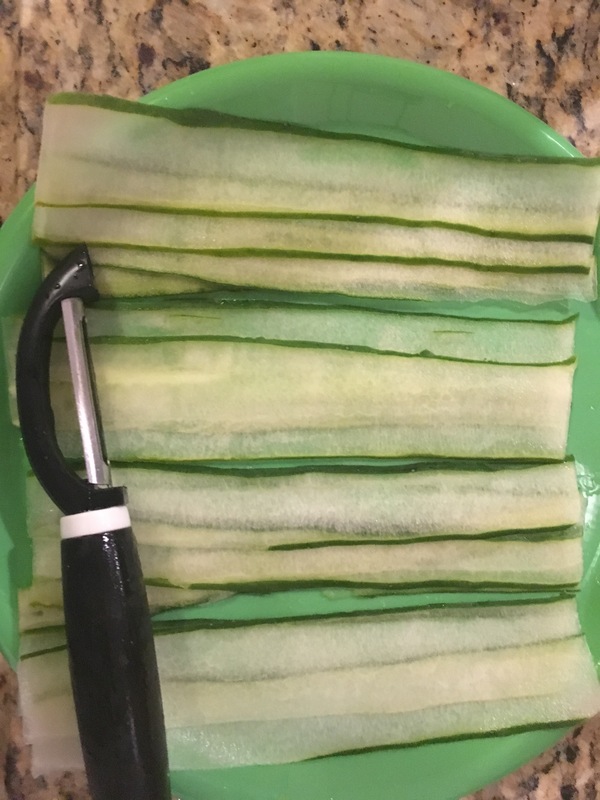 Peel layers of cucumber. Each roll should be about 2-3 “sheets”. For a thicker product, make sure to apply pressure on peeler. 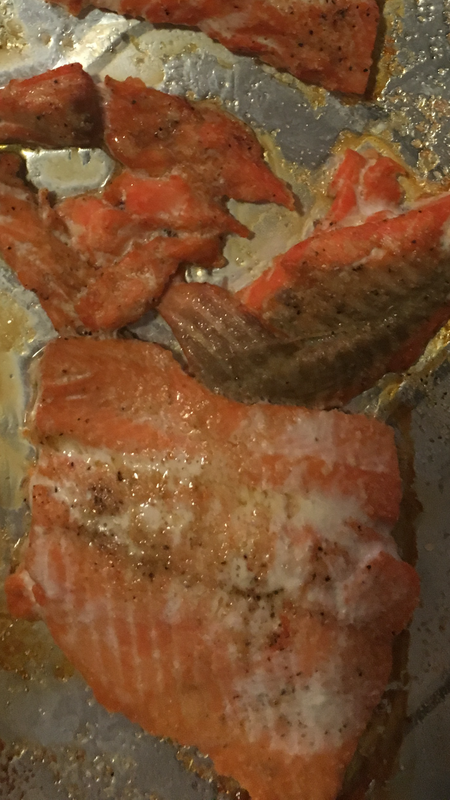 Salmon: Season with garlic powder, onion powder, sesame oil, pepper, and salt. Bake at 350 for 30 mins. 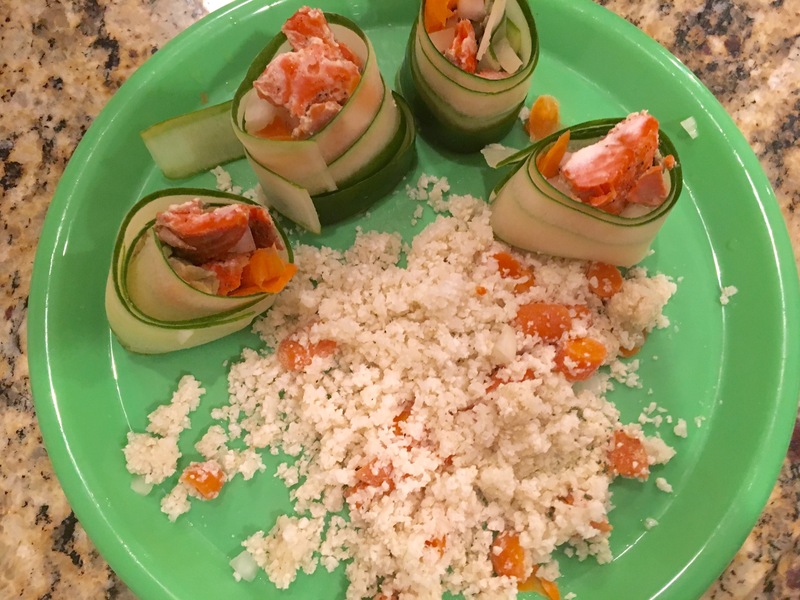 To form rolls, layer veggies and salmon. Roll forward. If cucumbers unravel, use avocado as adhesive. Another #leftoverremix for when your stomach, taste buds, and soul just can’t do the same meal a fourth time in a row. 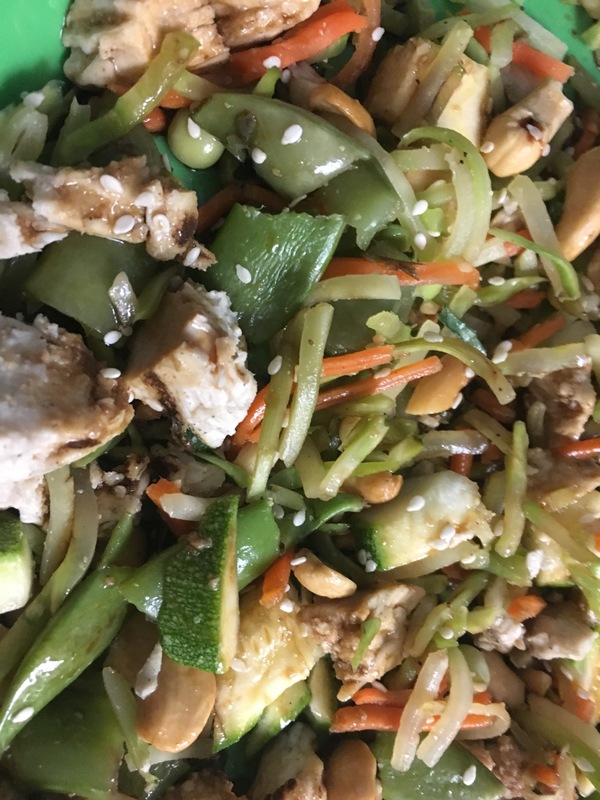 In the fridge, we still had leftover broccoli slaw, chicken, sugar snap peas, and zucchini. Despite how delicious the Zucchini Pillows turned out, we opted to create a nice chopped salad with the remaining ingredients. 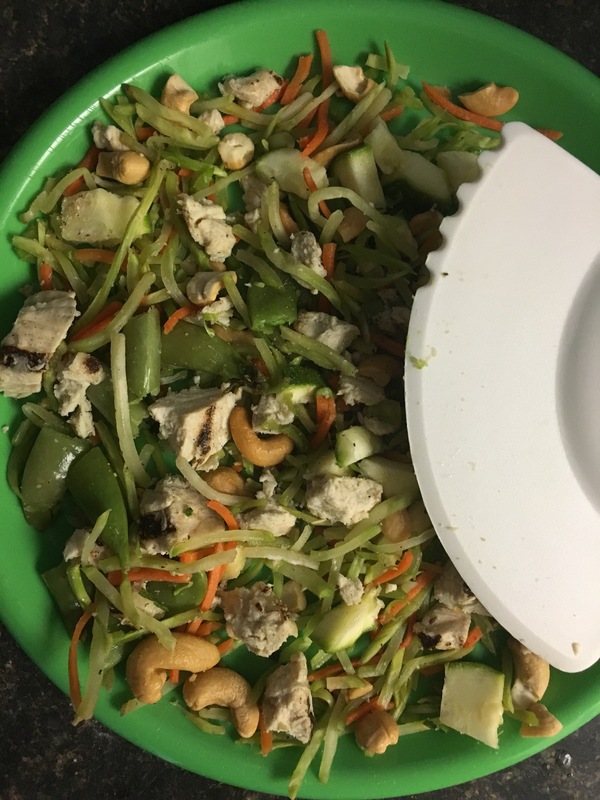 First of all, if you are a raw food eater or seriously interested in a healthy diet at all, investing in a salad chopper (or a pizza cutter, but remember what you bought it for!) would be highly beneficial. 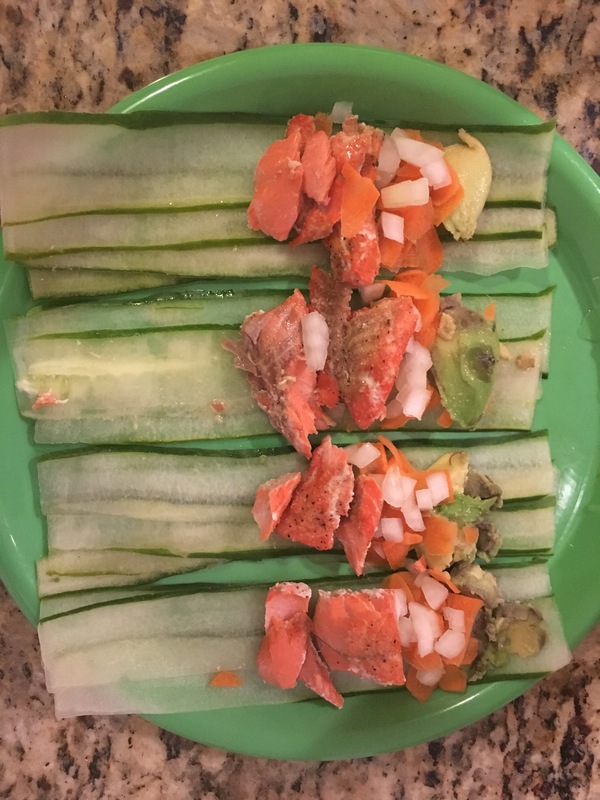 It makes salad much more bite size and also helps to mix around dressings and ingredients. Additional throw-ins, like edamame, rice noodles, or any other leftover veggies, will fit right in. Feel free to get creative and share your results! Missing pasta? Absolutely. All the time. Even in between bites when I’m actually eating it. Truth is, pasta is just one big carb bomb. More than bread and rice, pasta is filling, heavy, and only ends up sitting around your waist. But there are options that can itch that scratch without putting your diet in the danger zone. 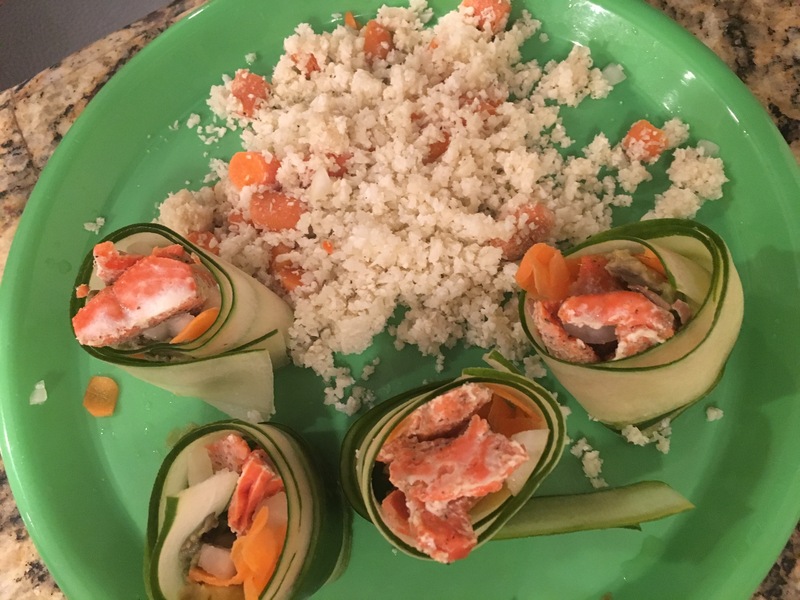 Zucchini is very versatile. It can be manipulated in a variety of ways other than just cut up and fried. 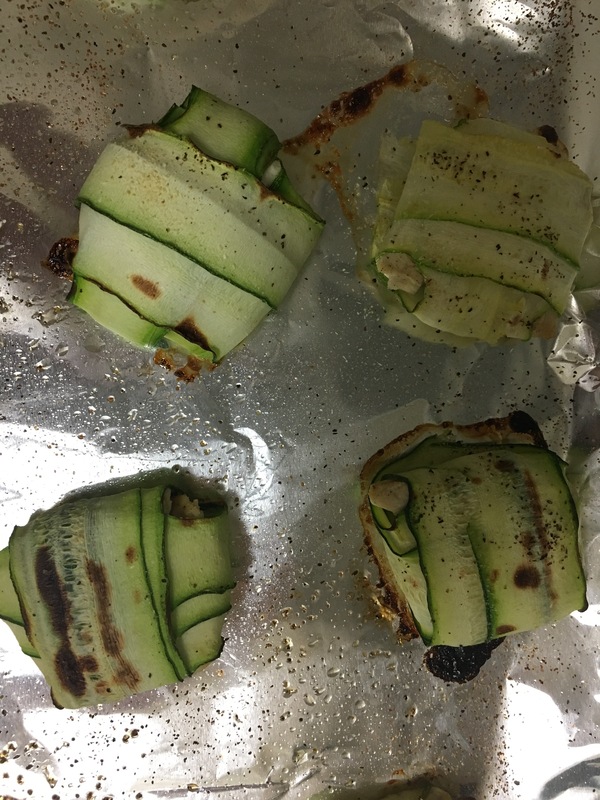 Here we have created zucchini pillows, a kind of “blanket” (see what I did there) term for either a ravioli or a dumpling. Directions: With the vegetable peeler, cut 2-3 strips to form the vertical strip as seen above. Repeat the same process to form the horizontal piece. The strips are frail and may need more than 3 to support the chicken. Cut chicken into small pieces (what I have used is premade. Sue me:). Place in center. You can add any seasoning (garlic, pepper, etc) or even cheese to act as more of a binder. 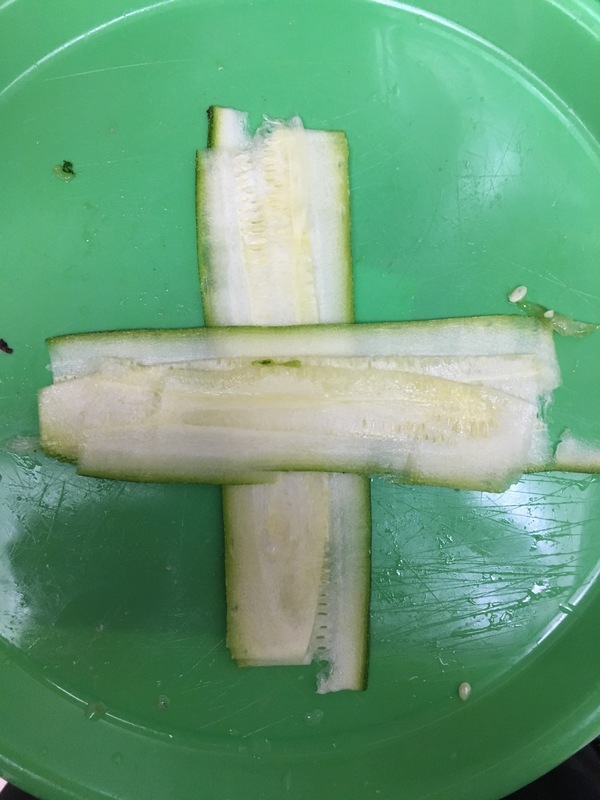 The rolling process is best done by first selecting an end that is underneath the other zucchini strip. Then pick an end that is on top, followed by the remaining underneath end, and finally finished with the last strip. BE SURE TO BE DELICATE. They can fall apart at a moments notice! Bake at 350° for 15 minutes. Then broil for an additional 10. 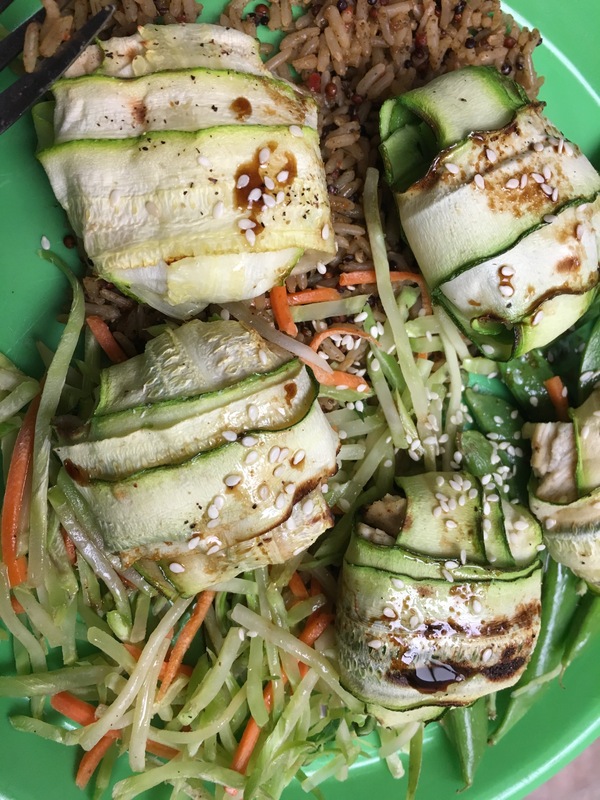 We have prepared these with a sort of Asian inspiration (more so dumpling than ravioli than) consisting of broccoli slaw, sugar snap peas, and rice with a drizzle of soy sauce/sesame oil. These can also be done with cheese or any other protein in a red sauce as a ravioli substitute. Try them out, you won’t regret it!